In the beginning Roy did not start out as this crazy Animatroncs project he has become. My initial idea came to me a couple of years ago. I was inspired by all the amazing micro controller projects I was seeing online. These small extremely affordable Arduinos were being used by makers everywhere. 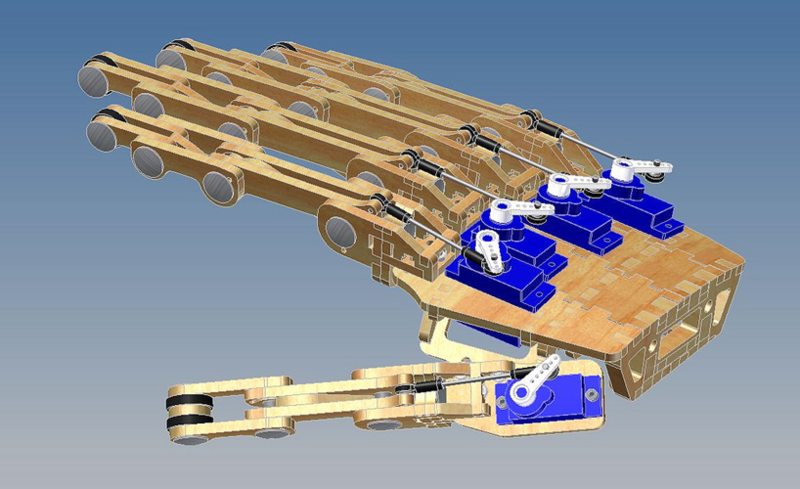 But I started to notice that many of the projects were lacking cool mechanical hardware. That’s when the thought hit me. Let the electrical guys build the circuits, let the programmers write the code and just do what I do best. 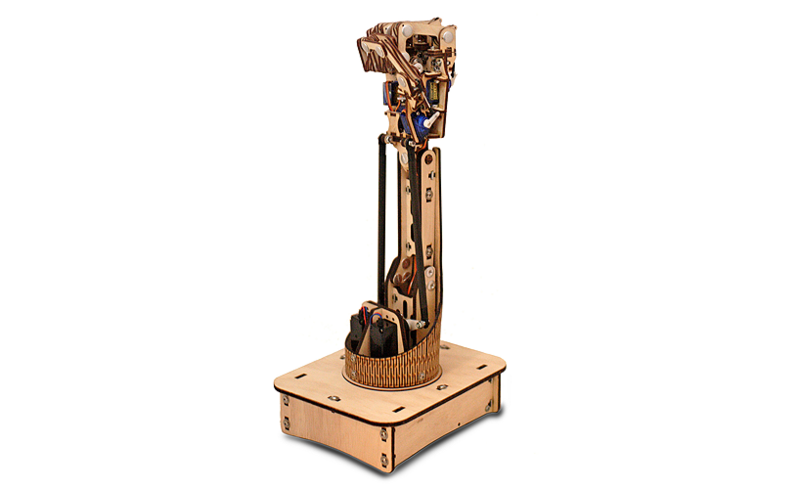 Build cool mechanical creations. Since my greatest passion will always be building mechanical puppets for films, I decided to head in that direction. My first task was to decide on a design style that would be affordable and easy to produce. I had used laser cutters before and was familiar with the incredible things they could create. So I made the decision to see just how far laser cut mechanics could be taken. With a used laser cutter and a stack of servos, I started my journey. First was a finger. Then that finger became a hand. That hand needed an arm and that arm needed……But wait, I wonder if I could do a full eye mechanism. Those eyes needed a place to go, so onto a skull I went. That skull needed a jaw to talk….. Well you can see where this is going. That brings us to the state Roy is in right now. He has two completed lower arms and a completed set of eyes. The skull and jaw still need some work. Everything else in the video is just some painted drain pipe assembled to hold all the parts where they go. Because Roy has turned into a much more complicated project than I had ever imagined (he is sporting 28 servos in the video with countless more to go). I have decided to break his offering into pieces. The idea has always been to get cool stuff into the hands of other people. I think a series of projects is my fastest way to do that. We are going to start with his hands and arms. If funding is successful, then we will move onto his eyes, from there it will go upper arm, shoulder and chest. When we are all said and done you will have a life sized Animatronic character to do your bidding. One of the most important parts of this project for me is the community I hope we can build. While this stuff is fun to build and interact with, the experience becomes so much better if you can share your work with like-minded people. Lets get some of those electrical guys/gals to build better servo controllers and the programmer guys/gals to write better animation software. I would love feedback on my designs. Maybe you know of a better servo controller than the one I have chosen. How can I improve my mechanisms? Let’s get a dialog going. I decided to come to Kickstarter with this project because of the broad range of technical and creative people it seems to draw. There is no better place to offer such a unique project to such a large group of like-minded people. The funding that this project will generate will be used to help out the laser cutter I had mentioned. The laser tube in these machines have a limited life span and mine is unfortunately at its end. 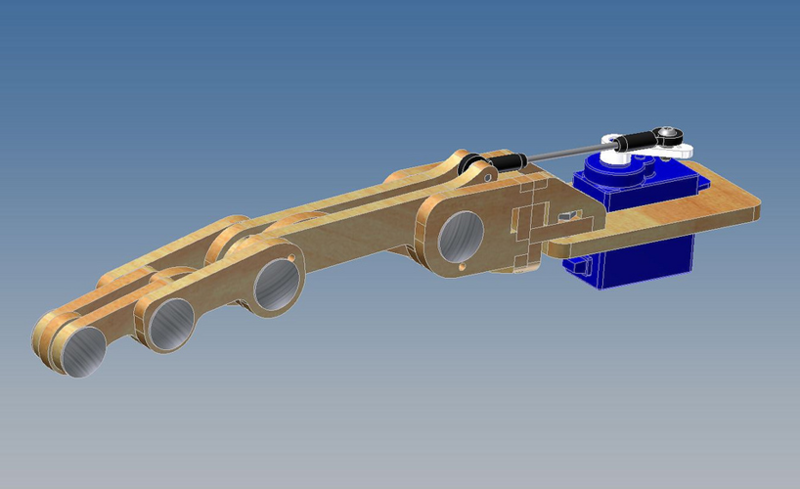 I would also like to stock up on materials and servos for the next stage of the project. With the exception of the Roy’s Ultimate Arm Display, all rewards come in kit form and do not include any control electronics. Why have I chosen not to include any control electronics? It goes back to my initial concept of the project, Supply cool mechanical systems for people to use with whatever controller they wish. For those of you who are not working with any particular electronics now or have never before, I will supply detailed descriptions to everything I used to get Roy moving like he is. 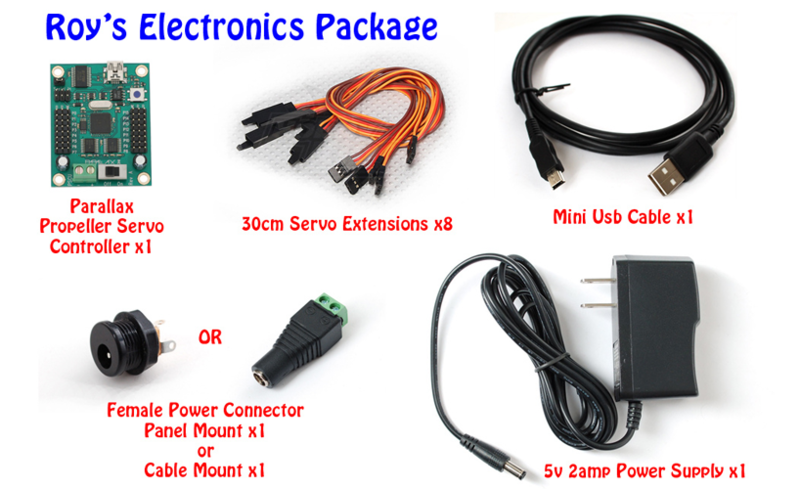 Servo controllers, Wiring diagrams, Control software and so on. Since most of the rewards come as kits, I would like to talk a little about the construction techniques. Building one of Roy’s kits will be very similar to building a wooden model airplane kit. Some parts will be glued, some will be bolted and others are captured in place free to rotate. Lets take the palm of the hand as an example. 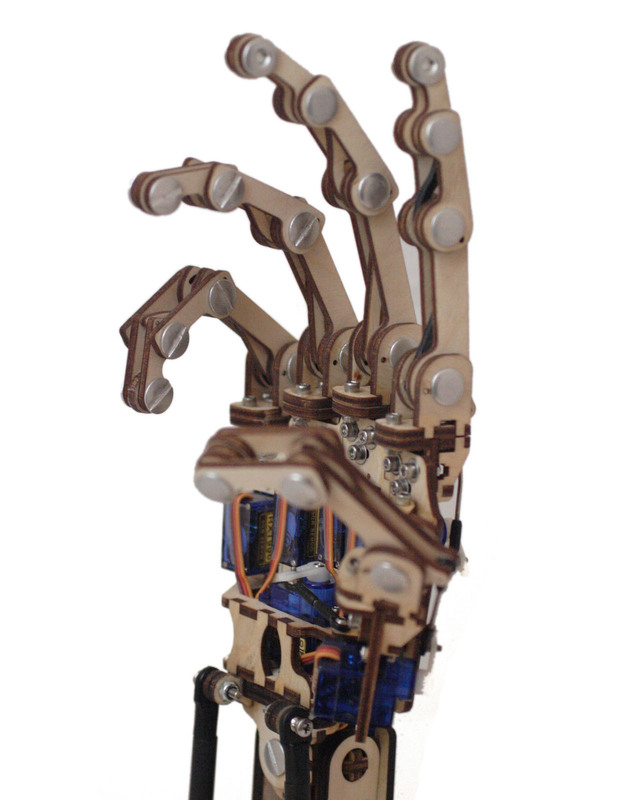 As you can see in the picture on the right the palm is made up of 10 individual laser cut pieces. How these pieces are assembled determines if you are building a right or left hand. Because we use a tab and slot design, the pieces automatically align when joined. The palm on the left has not been glued, but it holds together nicely because of the interlocking joints. 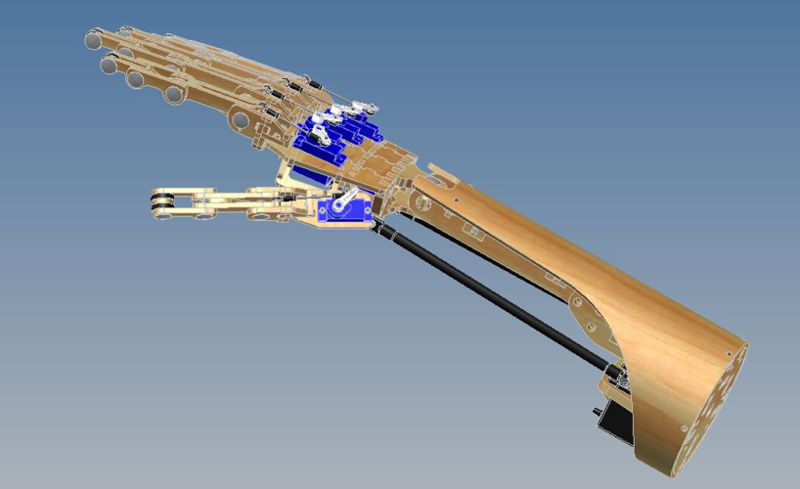 The palm is the largest glued structure in the arm, it is amazingly strong and light. I will be creating a Lego style building instructions, along with video tutorials to help you along the way. Because of the self-aligning style of theses kits, the building is fairly easy. The most important part of the building process is patience. 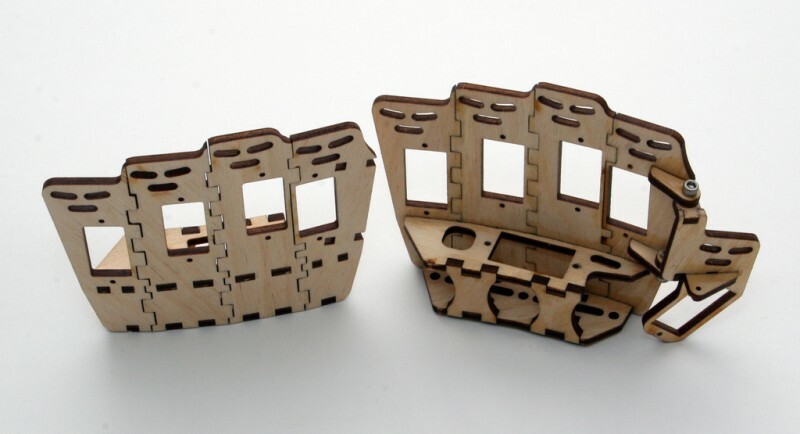 The full arm kit has over 100 laser cut pieces. USPS Priority Mail International Small Flat Rate Box – $12 additional Shipping. This box will ship the Roy’s Finger reward or the Roy’s Hand Reward. Tracking is not available for the small box. USPS Priority Mail International Medium Flat Rate Box – $37 additional Shipping. This box will ship the Roy’s Finger, Roy’s Hand, Roy’s Arm or Roy’s Arm Display reward. Tracking is available for the Medium box. Here is a video of one of the first animatronic hand projects I worked on about 10 years ago. Unfortunately the film was cancelled before we finished. My part begins at the 54 second mark. Thank you for taking the time to explore my project. If there is anything I may have missed, please feel free to ask.